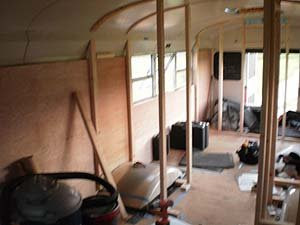 Today makes the 30th day that we have spent working on the bus. It feels like we are moving along at a good pace now. 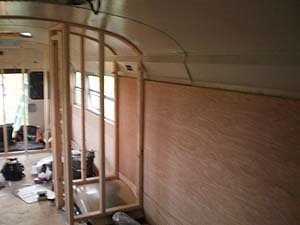 The Rear wall is now all framed up. You will notice in the pic below, a framed in box near the top of the wall. This will be a shelf. 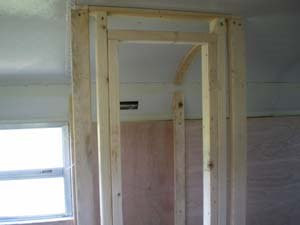 We started today by framing up the master bedroom closets. This is not as easy as it sounds and is very time consuming. The main reason for this is because you can't plum or level any surface of the bus. Everything has to be measured and double checked to make sure that everything is lining up right. The rounded ceiling does not help make things easier. 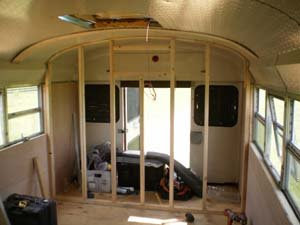 We started by attaching the vertical studs against the wall. 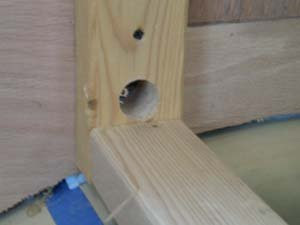 We cut the tops of the studs at an angle to follow the channel at the top of the wall. Then we screwed down our bottom plates. We are putting these two closets right over the rear wheel wells so we had a little maneuvering to do there. When it came to the top plate it got tricky. I wanted the surface of the top plate to hug the roof line. Yesterday I actually took my top plate boards and had water running on them with a weight directly in the middle so they would sag. This gave a little arch in the wood. It wasn't enough, so I cut many grooves in the wood so it would give. All in all we got the results we wanted. After the vertical studs were in I drilled a hole for the wire that will power the lights in the master bedroom. This was the existing emergency exit hatch alert system wire that was disconnected from the rear hatch. Since it was already ran through the ceiling we will use it for lighting. This wire will run to a light switch on the closet wall inside the master bedroom. 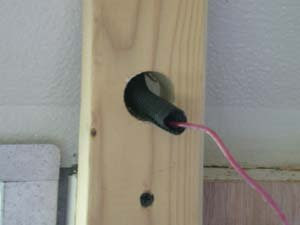 I also made sure to drill a hole through the stud into the wire channel that was enclosed in the wall. This channel is where all my electrical wire will be run. 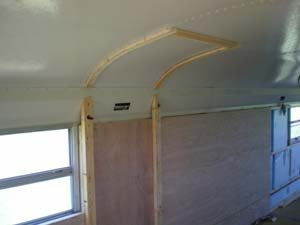 It runs the full length of the bus on both sides. 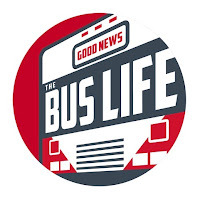 I have a string in the channel that will enable me to be able to pull any wire through that I need for powering various outlets and lights in the bus. Next was putting the framing for the door in place. I of course had to cut the studs at a slight angle so they would line up with the roof pitch. I framed the door opening at 14" to fit a 12" door. You can see here that the door opening is now framed. We did not screw any screws into the top of the wheel wells. The bottom plate that runs along the top of the wheel well (see pic above) was screwed into the vertical stud on each side of the wheel well. We did not want to have any holes in the wheel wells. When we did all our laying out we made sure that every wall would rest under a roof support beam. This way the top plate can be screwed to the existing supports adding a lot of strength to the framing. The drivers side closet is now framed up! 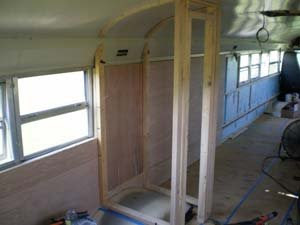 We were able to get started on the passengers side closet and will have that done tomorrow.